The League of Princes is back for one last hurrah! This time they are outlaws, accused of the murder of Briar Rose. Yes, she is dead. At least that's what the bards' songs say. And it's not just the princes who are on the run; the princesses are with them too. Well, all except Briar Rose, of course. And while trying to clear their names, the princes uncover an evil plot to take over the thirteen kingdoms! The Hero's Guide to Being an Outlaw by Christopher Healy takes us on another crazy adventure with the bumbling princes and the women they love. 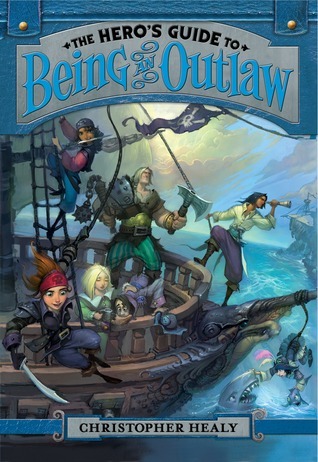 Most of the characters from the first two books in the series have a role in this final story, and new ones are introduced, including a group of pirates. If you read the first two books in the series, you'll absolutely want to read this conclusion. As with the rest of the series, there's much humor and silliness from start to finish, but a clear focus on the relationships between all of the main characters. Friendships are strengthened in this final book, and love blossoms for just about everyone. There's plenty of action and adventure, strong characters and characters who seem to get lucky a lot! And at the end, fans of the series will likely be content, although it does seem there's room for another adventure... someday. The Hero's Guide to Being an Outlaw will be published on April 29, 2014. It is a great selection not only for adults like me who find the take on the classic princesses and their princes great fun, but also for middle grade and teen readers. While the stories appeal to me, they are perfectly appropriate for older elementary readers, like my son, who is 9 and loved the whole series! This review was written based on a copy of The Hero's Guide to Being an Outlaw that I received from the publisher in exchange for an honest review.